Website security has become the talk of the internet. With security loopholes discovered almost every other day, we know you’re concerned about your website. We recently shared a few easy ways to secure a Drupal website and this time we want to talk about a few tips to secure your Joomla website. 1] Updates: Your Joomla website and the supporting extensions should always be updated. Updates add more features or a security patch which is essential for your website in order to block any possible loop holes. These updates are generally very easy to install and won’t take much of your time. Think about this, it’s easy to update your website and it’s components than to figure what caused your website to crash and rebuild it again. Remember to take a backup before you apply the updates. 2] Delete unwanted extensions: Keep only those extensions that are required for your website, the rest need to be deleted. Many beginners tend to try a lot of extensions to see how it will help them with their website. Only a few extensions end up actually giving value to the website, the rest are just lying there with absolutely no additional benefit to the website. They simply take up your hosting space and can also become a potential threat to your website if they are not regularly maintained (updated). 3] Use strong login details: We are all aware that we need to set up strong passwords to secure the login page but we also need to setup an equally strong user name. The default usernames are generally ‘admin’ or ’administrator’ which are vulnerable to brute force attacks. Think of usernames as passwords and make it strong and not easy to guess. This way you’re adding another barrier for an attack on your website’s login gateway. 4] Setup right permissions: A very important tip to secure a Joomla website is setting up correct permissions for your website’s files and folders. We recommend setting the permissions of the folders to 755 and the files to 644. If you’re not aware on how to make changes to the permissions then you can check out this blog post. Never use 777 for either your files or folders as this gives read, write and execute rights to everyone. 5] Security extensions: If you need an easy solution to take care of your website’s security then you can utilize one of the many security extensions available. You can try jSecure security extension, which covers a lot of security features that you will need to secure your Joomla website. Website hacking is on the rise and thousands of websites are becoming victims each day. You may be running your website on WordPress, Drupal or any other Content Management System but the risk of being hacked is almost the same for all. We are here today to share with you 4 very easy ways that will help you secure your Drupal website. 1] Did you know that you could actually limit the number of login attempts to your account? Brute force attacks are common these days and the only way in, is through the login page. You can use a module called Login Security to temporarily or permanently ban IP addresses that are attempting a brute force attack on your website. 2] You need to enable auto logout for all the users of your Drupal website. Incase if your laptop gets stolen and you are still logged in then they can mess up your entire site. You can check out the module Automated Logout which will log out users after a specific amount of time. 3] Finally you need to update the Drupal core and all modules that are supporting your Drupal website. This will ensure that the any vulnerability with the older versions is taken care of. We recommend that you always take a backup before performing any update. We do agree that there are more complex ways to strengthen the security of your Drupal website, but think of this as the basics which have to be done. You can start by setting up strong alpha numeric passwords for all your website users. Sometimes the biggest of the issues arise due to the smallest of the problems hence all precaution measures need to be taken. Do leave a comment below if you have any crucial ways to secure a Drupal website. We live in a time when almost every argument will end in “Google it.” Search engines have evolved so much and have become a part of our life. Need to research for an assignment, find cheap airline tickets or even find new places to hangout, search engines have always come to the rescue. Search engines over the years have become smarter and more efficient in providing you with great websites for information. With improving algorithms and technology, the search engine industry has taken a very positive change. This has ensured that we have access to quality content at the quickest possible time. But not everyone has been too happy with these frequent algorithm updates. Many site owners have been impacted and have seen their search engine ranking go down considerably. The only way to survive has been to abide by the ever changing rules. Honestly, it’s difficult to go back and make changes to all your previous work but unfortunately that’s the only way about it. Now you can’t really blame the search engines for this. They want to provide the best experience to their users and by coming up with these algorithm updates they are ensuring that they become more efficient at how they deliver good search results. We understand the plight of all site owners that are affected but it’s time that we make search engines our friend. Let’s not fight the changes but embrace it and use it to benchmark your work and understand if you need to push a little more, to make it to the first page of every search engine. We want to help you achieve this by providing our two cents on how to get your website ranking up. So let’s begin. Avoid writing for the sake of creating more content. Always focus on writing AWESOME quality content which your users will actually want to read. There are big websites out there like Social Sprout and Mashable that churn out tons of research backed content and in return they are always rewarded with good traffic. The content is also so good that people will want to share it thus creating a very positive ripple effect. Search engines are taking quality content very seriously and they are always looking for value addition that your content can bring to its end users. Does your content bring value add to your visitors? If not, then it’s time to re-evaluate your content strategy. This one aspect is very critical in improving search engine ranking. Google assigns a domain authority score to every indexed website. This score can be improved by the number of websites that link back to yours. Basically, link backs will notify search engines that your website is a resource to them. So more the number of link backs better your domain authority score will get and better domain authority score will only mean better search engine rankings for your website. But we also need to understand that quality is always better than quantity. A website with a high domain authority linking back to your website will always be better than 100 websites with a low or moderate domain authority score. So a link back from a Mashable or a Social Sprout is definitely going to drive your search engine ranking upwards. 3] Be Social: Social networking sites like Facebook, Twitter, Linkedin etc have given everyone another medium to reach thousands and sometimes even millions. It is become a crucial tool for businesses to create awareness of their products. Your content will get shared if the shareable quotient is really high. Again the point no. 1 of writing quality content comes to play here. If your content has got value for your readers then the chances of it getting shared multiples 10x, this means more people are going to see your work. If your work is exceptional, then get ready to see it go viral. This only means that you are going to see a lot more traffic moving to your website. Search engines also do evaluate the social quotient of a website to rate it higher in rankings. So going social with your work is definitely a good idea. So what do you think about these points. Do drop a comment below if you have any tips and tricks to share. Surely, there are times you come across certain websites that are so beautiful that you just want the same theme for your own website. We’ve got folks who’ve bookmarked so many such websites but could never really figure out the theme that was being used. Honestly, finding the right WordPress theme can be a real challenge. It’s not because the themes aren’t good but there are so many out there that you’re simply spoilt for choice. Looking through the source code of a website is one way to find the theme of a WordPress website but unfortunately site owners change or modify this for security reasons making it difficult to identify the theme. Another cool way of finding out the WordPress theme is with the help of the website whatwpthemeisthat. 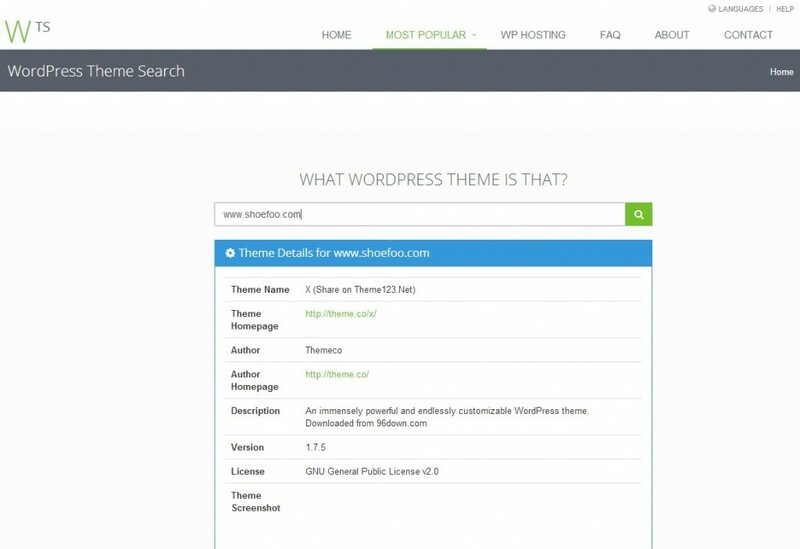 With the help of this tool, you will be able to find the theme of a WordPress website in no time. All you need to do is search for the website and it will give you all the details of the theme including the author, author homepage and the version of the WordPress theme. What makes this tool even special is that it also detects the WordPress plugins that the Website is using. This feature comes handy especially when you want to know the plugins responsible for adding functionality to the website. Mind you, there are site owners who use customized or proprietary themes and this tool will not be able to help you in such cases. Else, it’s just aces! If you know of any other way through which you can identify a WordPress theme, let us know in the comment section below. When you are powering 1 out of every 5 websites in the world, there is no doubt that you are pretty awesome. We are referring to the most popular Content Management System – WordPress. Ease of use, thousands of available plugins & themes and abundance of online support has contributed to its thumping success. There is no doubt that you can setup your WordPress site in minutes, but maintaining it is a different ball game all together. In this post, we are going to share some ways to ensure that your WordPress site is running in top shape and at all times. 1] Never miss any updates: WordPress is an open source platform hence bugs and security flaws will always be at its tail. Occasional as they may be, updates available for WordPress are a great way to counter any issue and at times to improve the overall experience of using your website dashboard. Avoiding these updates will only leave you exposed to security threats and put all of your hard work at risk of being lost. Similarly, plugins and themes need to be updated to the latest version to avoid creating a gateway for security threats and also to ensure compatibility with the latest WordPress build. 2] Delete unwanted Themes: There are a lot of themes out there but eventually you are going to just use one for your website. Though the rest are deactivated, they can still pose a security threat if they are not updated. Also we noticed a strange lag while browsing through all saved themes, which somehow miraculously changed when we got rid of all the unwanted themes on a demo site 😉 . All themes that are not in use must go except for one default theme for backup. You can always reinstall themes whenever you need them so deleting them won’t really pinch. Also look out for themes that are light weight and don’t put stress on your resources. 3] Delete unwanted plugins: Plugins definitely add functionality to your website but at the same time it utilizes resources allotted to your website. In such a situation, you will need to ask yourself a question, can you live without this plugin? If the answer is a yes, throw that plugin out. Also get rid of any deactivated plugins on your website, since if you don’t update them, then you are creating loopholes for any kind of security threat. Don’t fall for the all in one type of plugins where you get loads of functionality. If you are only going to use one or two functions out of the ten, then the rest is of the code is simply waste of resources. You might as well look for plugins that focus on the functions that you are actually going to use. 4] Take backups: There are times while making a few changes or trying to add new features we might end up messing our WordPress website. Sometimes it becomes very difficult to undo these mistakes and that’s when we need to take help of our trusty old backups. They also come in handy when your website has been a victim to a security threat. We recommend regular backups and you can try BackUpWordPress plugin to do that for you. Trust us when we say that this is one thing you just can’t ignore. 5] Enable Caching: Whenever you load a website, there are files that are saved in the Cache which is in your computer’s hard drive. So whenever you revisit the same website again, the browser uses the files in the cache rather than the server to display the page. This process is called caching and ensures that less system resources are utilized and pages load quicker for all your visitors. You can use WP Fastest Cache WordPress plugin to configure caching for your website with just a few clicks. Try all of the above recommendations and you will definitely keep your WordPress website in great shape. You will need to keep maintaining your website as much as you can. Even if you have a single page website, login to your dashboard and ensure that every element is updated to the latest version. Remember to treat your website like a baby that continuously needs love and care.